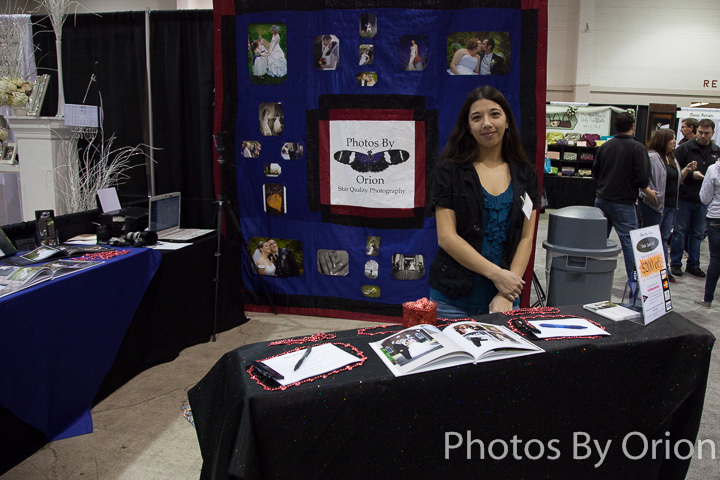 Photos By Orion has been in many wedding shows and events, including the Oregon Wedding Showcase, for many years now. Over the years I have developed some tips for couples who are going to a bridal show about how to get the most out of your trip. While these tips are geared toward couples who are just starting their wedding planning, most of the tips will apply to couples in any stage of planning. Also, while the examples are mainly for photography, the concepts can be applied to any wedding vendor. I hope these tips will aide in your wedding planning! Research – It is always good to do your homework, and a bridal show is no different. About a week before the show, you will want to check out the show’s website and see what types of vendors will be at the show. You also will want to sit down together and decide how much you of your wedding you will want to do yourselves and what you want to trust to the professionals. Keep notes and make a list of the professionals you are looking to hire. Then prioritize your top three types of vendors you want to visit at the show. This will give you a good road-map for traveling through the show. Bring a notebook and Address labels – When you go to the show, be sure to take your notes and some extra paper to take more notes as you go through the show. Take notes on elements you like or don’t like (for example: I like black and white photos, I don’t like pictures of the bridal party jumping, etc.) as you walk through the show. Also, have address labels printed out before the show that have your name, phone number, email, and wedding date on them. This will help you sign up at booths quickly and save your hand from cramping! Walk before you talk – You will want to make a round through the whole show before you stop to talk to any vendors. During this walk through, take your notes, get some good ideas about your likes and dislikes, and make notes on which vendors look interesting and which don’t. Many shows will give you a map or list of the booths when you register, which gives you a really good way to mark booths to visit or booths to pass by. Visit your priorities/favorites first – Once you have finished your once around, then visit vendors you marked as interesting which are in your three priority categories first. Talk with them, ask any questions you have about their area of expertise, and get a feel for if you could work with them. Keep notes, collect information, and most importantly have a good time! Be willing to sign with a vendor for a great deal, but don’t sign unless you are sure – When you are first starting your planning, take time to consider everything you take in at the show. There will be many show deals and inevitably some vendors who will try to hard sell you to “sign today.” (Can you blame them? This is their livelihood after all) I am definitely not saying you shouldn’t sign with them, but to be sure they are who you want before you sign. I know I (and my fellow photographers at PBO) have high quality work at a good value for your money, but I am not for everyone. I would never want you to sign with me to “get the deal” and then feel like you were pressured or cheated in any way. Professionals are there to make your wedding day smooth and easy! If you are within 6 months of your wedding date, then booking at a show to get the deal is a much better idea because (theoretically) you have already done your homework on what you like/don’t like and what each vendor needs to bring to your wedding, making it much easier to know that “this vendor” is the one for your wedding. The wedding industry is all about relationships, so like any relationship you should never rush into it. I really hope these tips help you make the most of any bridal show you attend. And for any brides in the Willamette Valley, I hope to get to meet you at the Oregon Wedding Showcase in October! This entry was posted in Bridal shows, Educational, Informational, Weddings. Bookmark the permalink.